Who are the best match play golfers in the current golfing landscape? Though all-time greats like Seve Ballesteros, Jack Nicklaus and Bobby Jones would head the list of the 'Best Match Play Golfers Ever' we have been considering the most impressive exponents of match play still playing today. To coincide with both Phil's $9M win just last week, and our new Premium Match Play feature which is now available on both iOS and Android devices, we thought we'd trawl through a list of golfers on both main Tours and pinpoint 'Six of the Best'. Fresh from his match play defeat in the seemingly universally controversial 'The Match' at the hands of Phil Mickelson, Tiger Woods can comfort himself both in the knowledge the $9M prize money won by his old adversary won't hurt his own bank balance, and in the understanding that he has possibly the best match play record in the modern game. Showing real grit in the format from a very young age, Tiger would go on to win three U.S. Junior titles as well as three U.S. Amateur titles before turning pro. And despite not having the best record in Ryder Cup, he has captured the WGC Accenture Match Play Championship on three separate occasions. It's quite clear to see that something quite unexplained occurs when Poulter takes to the match play format. Despite the lack of a major win, the Englishman has one of the most impressive win percentages in both singles and team match play and it has many multiple major winners firmly lagging behind. Often Europe's talismanic figure, Poulter is affectionately dubbed 'The Postman' because, as we all know, he always delivers. Match Play wins at both the 2010 WGC Accenture Match Play Championship and the Volvo World Match Play Championship have served to bolster his statistics. One of the most experienced golfers in match play these days is the Spaniard Sergio Garcia. At this year's Ryder Cup he became Europe's leading points scorer in history despite many golf fans initially questioning captain Thomas Bjorn's decision to give him a wildcard spot. It's particularly in the Ryder Cup team format where Garcia excels. In both foursomes and fourballs, he is almost unrivalled, creating lucrative partnerships with the likes of Jesper Parnevik, Lee Westwood and Luke Donald. Boasting a pretty healthy, if unspectacular, Ryder Cup record, Rory McIlroy has proven to be quite adept on the individual match play scene by capturing the WGC Cadillac Match Play in 2015 and coming close to following up on a few occasions. As time has gone on, McIlroy has developed a real thirst for Ryder Cup play and in 2016 formed an impressive partnership with debutant Thomas Pieters. Though perhaps merely developing his standing in the game at this point, Patrick Reed is already a major winner and a feared match play opponent. To date, Reed's main positive performances in the format have been in Ryder Cup, particularly at Gleneagles in 2014 and Hazeltine in 2016. Like the majority of his USA teammates, 2018 was a bit of a different story. Much like Ian Poulter, Luke Donald's match play skills defy a seeming inability to have ever truly challenged for major championship glory. The former world number one reigned victorious at the 2011 World Golf Championships - Accenture Match Play Championship in Arizona. Now languishing at number 528 in the Official Golf Rankings, it's clear to see that his golfing powers aren't what they were, but there's no denying his match play prowess through the years. He's also been on four winning European Ryder Cup sides. 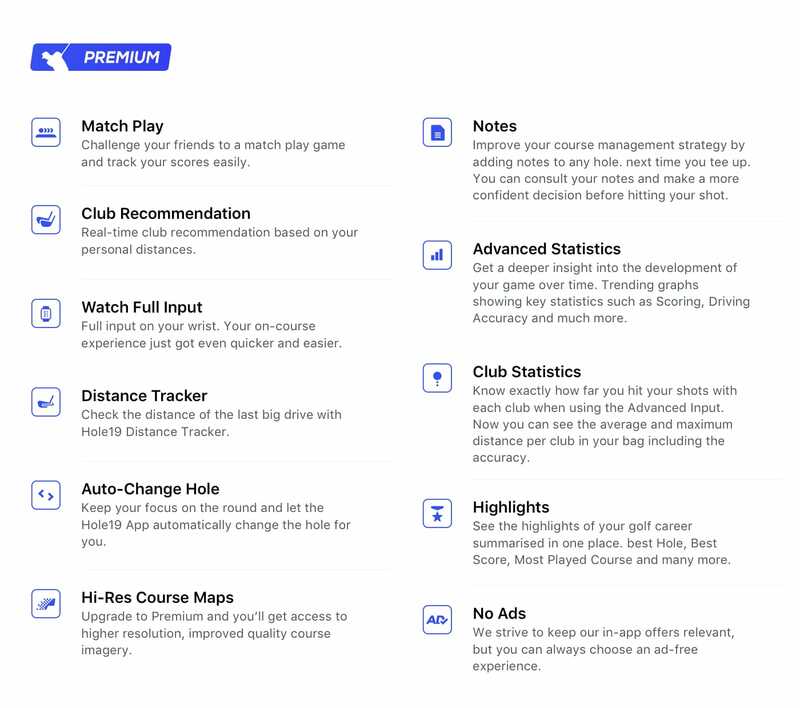 Want to try the new Match Play feature but not Premium yet? Not to worry, upgrading to Premium is very simple and you can do it through our website, where all of our plans have a free trial included. The clock is ticking for you to get a MASSIVE 50% discount on a 1-year Hole19 Premium subscription. 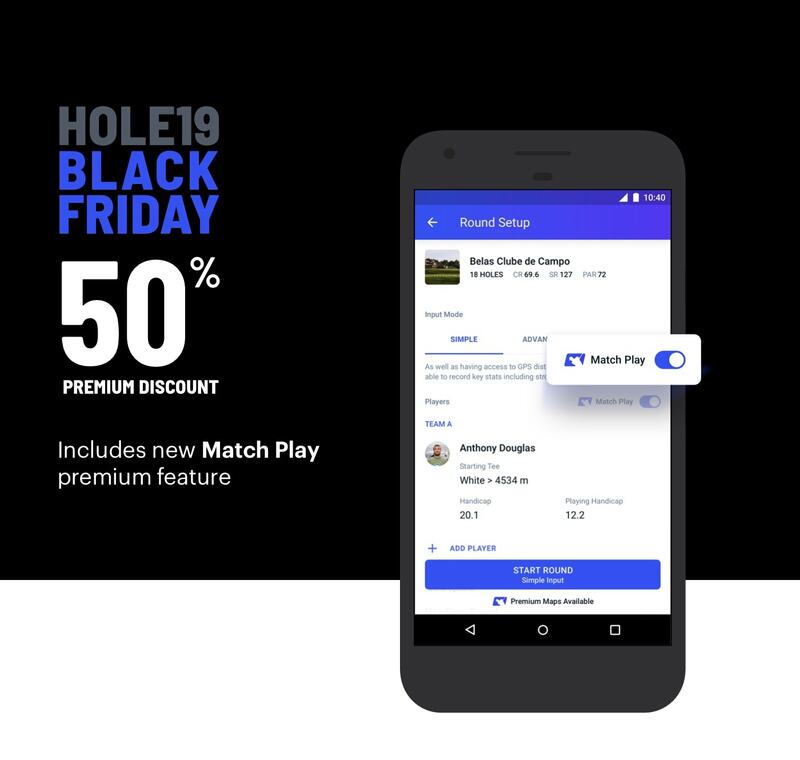 Act now and get access to our brand new Match Play feature, as well as many more game-enhancing features.